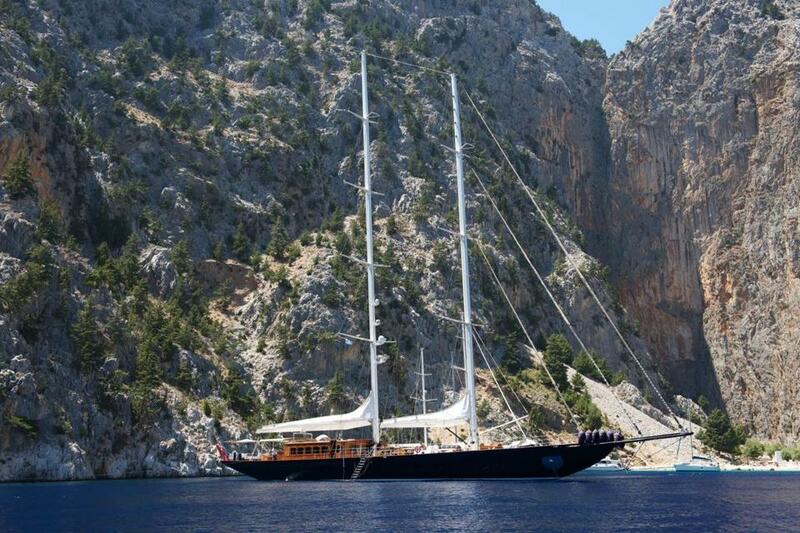 The 170-foot-long Regina idles in St. George’s Bay on the island of Symi, Greece. BODRUM, Turkey — On a white-hot day in this seaside town, a gaggle of onlookers gathered at the marina, snapping shots with their camera phones. Behind them hulked a 15th-century crusader castle straight out of a medieval dreamscape, and yet they’d trained their cameras on my seven traveling companions and me. It’s a heady moment when you realize you’ve trekked thousands of miles to a tourist destination like Bodrum only to become an attraction yourself. But who could blame them for gaping? We stood aboard Regina, at 170 feet the largest private charter sailboat in Turkey. With its sweeping, scimitar-like profile, lustrous mahogany woodwork, and towering masts, it’s a megayacht born to draw goggle-eyed stares. And while Regina has been turning heads on the Aegean since its maiden voyage in 2011, this fall it dazzled an international audience of millions as the backdrop for a steamy encounter between James Bond star Daniel Craig and co-star Bérénice Marlohe in “Skyfall,” the newest 007 film. Trysts with movie stars may not be in the cards, but anyone hankering to step into the Gucci shoes of the world’s most iconic secret agent can charter Regina — for $15,000 a day. Our plan for this pampered odyssey was to take in a balanced diet of beauty spots and heritage sites — but, above all, to unwind. So it was a relief to steam out of Bodrum and put the buzziness of Turkey’s answer to Saint-Tropez behind us. Sails hoisted, we glided past untamed coastline and mountain faces seamed with goat tracks. Before I could finish my first glass of champagne, the world of strategy meetings and deadlines was ebbing into memory. I had my first inkling then of what I’d realize time and again during my nine days at sea. A cruise aboard Regina is so much more than a hedonistic romp. The cushiness serves a larger purpose — blotting out modernity’s white noise, the better to immerse you in the ageless beauty and rich history all around you. Fitting, then, that our first port of call was the ancient settlement of Knidos, where we overnighted in sight of a well-preserved amphitheater. Whisked ashore in the morning on tenders, we picked our way among the sun-bleached ruins of this remarkably intact Greco-Roman archeological site, one of dozens strewn along Turkey’s southern coast. Our only company were a family of goats cropping the grass and a British couple whose young daughter gazed, stricken, at the ruins and asked, “What happened?” How to explain to her that history in this global crossroads is a tapestry as intricate as a kilim rug? A quiet square soaked up the sunshine outside the Palace of the Grand Master of the Knights of Rhodes, in Rhodes, Greece. 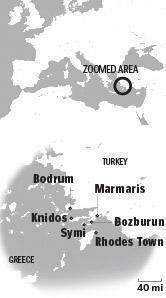 From there, we sailed to the stunning resort town of Bozburun, a sweep of sugar-cube villas fringing a dramatic bay. Hills reared up to dizzying heights, forming a deep bowl that amplified the five daily calls to prayer. But even in this sheltered idyll, the past made its presence felt. Among the gulets and motor launches berthed around us, one yacht was so huge that — with Bond on the brain — we surmised it could only belong to a power-mad villain. We weren’t entirely wrong. Although it had belonged to Kemal Ataturk, the founder of modern Turkey, it had briefly passed into Adolph Hitler’s hands after the heroic statesman’s death. Our days by now had settled into a relaxing groove: breakfast, a brief sail to some secluded cove, and a spell of energetic frolicking in clean, lapis-hued water. The Regina came equipped with a full complement of toys — two kayaks, a paddle board, snorkeling gear, and a jet ski. Then it was back on board for lunch, which we took at one of three canopied dining areas. Our growling stomachs were silenced by a chef who conjured delicious variations on the staples of the Mediterranean diet — squid, octopus, fish, and eggplant, and platters of sliced fruit. The six cabins, decked out in mood-lighted mahogany and marble, ranged from lavish to off-the-charts opulent. The two staterooms stretched across the boat’s 31-foot breadth, with white leather furnishings set aglow by backlighted panels of honey mousse onyx. For all the frills aboard, the main attraction remained off Regina’s bow. At no point during the journey were we out of sight of land. According to our captain, Yusuf, this is the siren song of yachting in Turkey. “People come for relaxing and sun,” he said, “but mostly they come for this,” gesturing at the vista of unspoiled promontories and haze-shrouded islets fading into the horizon. Sure enough, for hours at a time we sat on deck in silence, transfixed by a landscape unchanged since Odysseus’s day. Jauntily painted villas ring the harbor of the town of Symi, Greece. Sailing into Rhodes Town, the capital of the Greek Dodecanese islands, made for a hard landing back in modernity. But our distaste for the cruiseliners and high-rises crowding the shoreline — the only colossuses left in Rhodes — didn’t last long. 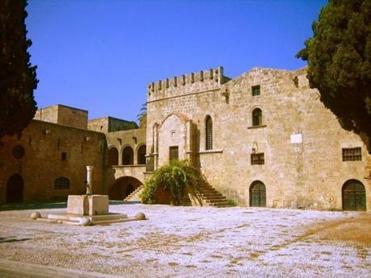 Old Rhodes Town, a UNESCO world heritage site, was once the stronghold of the crusading Knights Hospitaller. Later conquered by the Ottoman Turks, it’s an intoxicating brew of East and West — a fantasia of ramparts and minarets, sandstone masonry and geometric tiling, dotted with ancient excavation sites. Strolling its medieval streets, we could feel the place casting its spell. 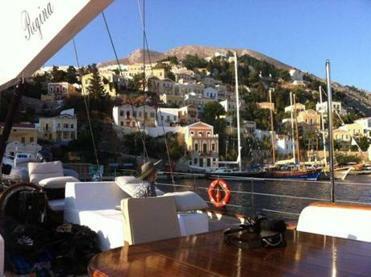 Rhodes was a hard act to follow, but our final destination, Symi, more than managed. We put into this jewel of an island just as the sun was beginning its final descent. Wreathing the harbor’s steep hillsides was a riot of candy-colored neoclassical villas, their pastels aglow against the arid terrain. vowed to spare Symi in exchange for a yearly delivery of sponges to his concubines. Sold, I forked over 18 euros ($24) for one — a bargain, factoring in the free history lesson. Later that night, after a hike to the spectacular Byzantine monastery overlooking town, we gathered on Regina’s foredeck for ouzo. A light wind sighed through the rigging of countless small crafts ringing the intimate harbor. Stirred by drink and the magic in the air, we recited poetry. Arguably a silly flight of romanticism — and probably a bit touchy-feely for Bond’s taste — but we couldn’t help ourselves. With the wraparound lights of Symi twinkling like so many eyes in an amphitheater, the least we could do was put on a show for this landscape that had served up such a feast for our senses — not to mention our souls. Marc Mewshaw can be reached at marc.mewshaw@gmail.com.